For almost ten years, Hooah Hill has thrived on ten acres in Waverly Hall, located in west central Georgia, near the Columbus, Fort Benning area. 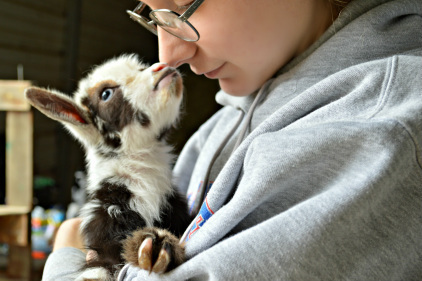 We are a "boutique breeder" that has established a solid Nigerian Dwarf dairy goat herd that is both beautiful and functional. We are dedicated to our goal to breed quality, healthy, conformationally sound Nigerian Dwarf goats that can be successfully used for milk, show, and beloved pets. We do not sell any goat for human consumption. The care and management of the herd is a family affair. We are diligent in our efforts on a daily basis to maintain the highest level of care possible, providing a loving, clean environment and choosing only NON-GMO grain and organic supplements to sustain the optimal health for breeding and milking. The goats are all vaccinated annually for CD&T and tested for CAE and Johnes. Our goats' good health and comfort are our primary goals. Our milking does are the cornerstone of Serra Hinzman Soaperie providing their lucrative NON-GMO goat milk! We have not as yet participated in any ADGA milk testing programs. We will be happy to provide you with as much information as possible regarding the milk production of each doe. Who are Bunny Boo Goats and Ty Dy Farm? We get asked this a lot! Many years ago we were inspired to acquire Nigerians by our young daughters, Katie and Becca (Bunny). When we were building our foundation herd, we encouraged our kids to be fully vested in the "business". So, Katie and Bunny established their own herd names with the American Dairy Goat Association (ADGA) - Katie's herd is Ty Dy Farm and Bunny's herd name is Bunny Boo Goats. So, you will find some goats with Bunny Boo and Ty Dy prefixes, but they are all part of the Hooah Hill family! All goats listed on this site are ADGA registered. FOLLOW HOOAH HILL ON FACEBOOK - Send us a Friend Request and you won't miss any updates! May 6, 2017 2nd Annual Carrollton Classic Show, Carrollton, Georgia - What a great show! Our load was a little lighter because of the success at the previous show, but our only remaining Junior, three month old, Hooah Hill Hail Mary, won both her classes! We are very much looking forward to showing her this fall as an older Junior! Her full brother, Hooah Hill Ba Da Boom, remains undefeated also winning both his classes looking as handsome as ever! Our sister 2-3 Yr. Senior Milkers, Tootie and Zsa Zsa, placed competitively in large classes despite being on a once every other day milk schedule! April 22, 2017 GDGBA Spring Show, Monroe, Georgia - We are honored to have received two Junior Grand Champion and one Reserve Senior Grand Champion and one Reserve Junior Champion awards along with many other high placings, in a very large and competitive group of Nigerians! ​Hooah Hill Hallelujah garnered the Junior Grand Champion title under the scrutinizing eye of judge Tim Flicklinger. Judge Flicklinger then chose Hooah Hill Honolulu as the Reserve Junior Grand Champion! HHF Honolulu then went on to show under judge Anne Clagett who chose Honolulu as her Junior Grand Champion! ​Our very own Bunny Boo Goats Tootie Lou won her Junior Grand Champion title in her first time showing at the Georgia National Fair in 2015. Now as a two year old first freshener, Tootie's second time in the show ring resulted in a Reserve Senior Grand Champion award from judge Tim Flicklinger! ​Our 2017 retained doeling, three month old Hooah Hill Hail Mary, placed an impressive second and third in extraordinary large classes! ​HHF Hail Mary's full brother, Hooah Hill Ba Da Boom, placed first in both of his classes of the buck show! However, the true star of the show wasn't even at the show - Bunny Boo Goats Zagora! She is the dam of BBG Tootie Lou and BBG Zsa Zsa and Grand Dam of HHF Hail Mary and HHF Ba Da Boom. What made us so very proud at this show was the large, competitive 2-3 Yr. Milker classes under both judges, three out of the four top placings were all Zagora kids - Tootie Lou, Zsa Zsa, and Ivy Hailey's, Sugar Baby! Out of Zagora's two kiddings, she has produced FIVE Champions!!! What a testament to her strong, positive influence on our herd! Zagora is out of Little Tots Estate SugarBunnyB. SugarBunnyB was our very first Nigerian doe we purchased from Rusty Repp many years ago to begin our breeding program. Thanks Rusty! Click here to enter the realm of luxurious, NON-GMO goat milk soap!